Easily integrate Netwrix Auditor with any SIEM solution through a RESTful API using one of our free add-ons. Choose the add-on designed for the format of input data your SIEM supports. 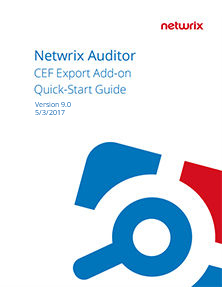 Use this add-on to integrate Netwrix Auditor with any SIEM solution that supports input data in .CEF format. Use this add-on to integrate Netwrix Auditor with any SIEM solution that supports input data in event log format. so make sure you have Netwrix Auditor installed. Enrich your SIEM output data with actionable context in human-readable format, including the before and after values for every change and data access attempt, both failed and successful. Spend less time investigating SIEM alerts on anomalous user behavior. Actionable security analytics empower you to quickly investigate unusual activity and mitigate risk, as well as determine how to prevent similar problems in the future. Minimize the volume of indexed data by feeding your SIEM with actionable audit intelligence and make your SIEM more cost effective. Review detailed instructions for installing and configuring the add-ons in the guides below.